Opening up your clothes dryer to discover a tube of lipstick went through a dry cycle, staining not just your clothing, but the inside of your dryer, can be a horrifying experience. After you remove the laundry and deal with the fabric stains, turn your attention to the dryer. You'll discover the lipstick stains on the inside of your dryer can be remedied. Removing lipstick stains from your dryer is the same process as removing wax crayon stains. Toss a load of rags in the washing machine and run through a complete wash cycle. Unplug the dryer from the electrical outlet. Spray a lubricant onto a paper towel. WD-40 will work. Wipe down the inside of the dryer with the lubricant-moistened paper towel, to remove the lipstick. Fill a bucket with hot water and a few drops of liquid dish soap. Dip a clean rag in the soap solution, wring out the excess water and wipe down the inside of the dryer, removing any lubricant residue. 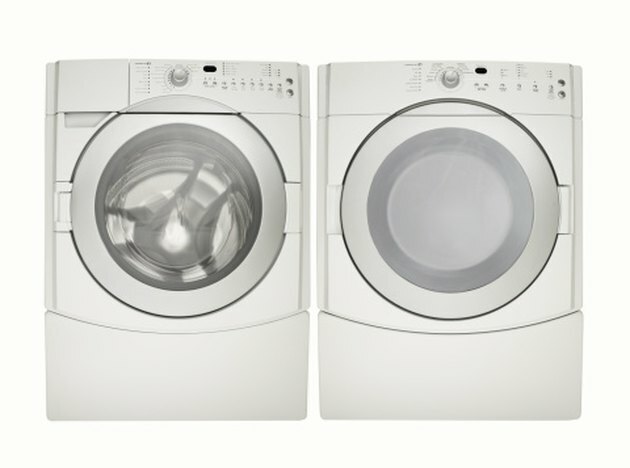 Throw the wet, clean rags from the washing machine into the dryer and run them through a complete dry cycle.